We have an easy way for you to help out and have an impact on Mychal’s Learning Place. It’s so simple for you to support Mychal’s on a regular basis no matter what your budget is. Take a look at the chart below and choose a level that works for you. A monthly gift of any amount will make a big impact on the programs and activities of Mychal’s students. We want YOU to be a part of that impact! Please note: This list shows only a few examples of what your monthly donation could provide for the students of Mychal’s Learning Place. Mychal’s is in a wonderful new phase of growth right now and great things are happening! Our most recent accomplishment is the purchase of our building in Hawthorne, CA. We closed escrow on July 2, 2015… 14 years to the date that Mychal’s first opened. This could not have been done without the support of the community and we’re incredibly grateful. Now, Mychal’s students and families will have a place to call home for generations to come! We have more participants than ever right now and we know that our programs are in high demand. With the purchase of our building, expanding programs and new employment ventures, our expenses have increased. CLICK HERE TO BECOME A MYCHAL’S GEM! You’re information will not be shared with anyone and charges will be secure through PayPal or authorize.net. 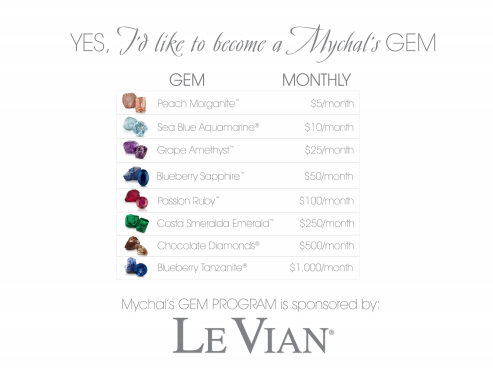 Mychal’s GEM Program is sponsored by LeVian Jewelers.